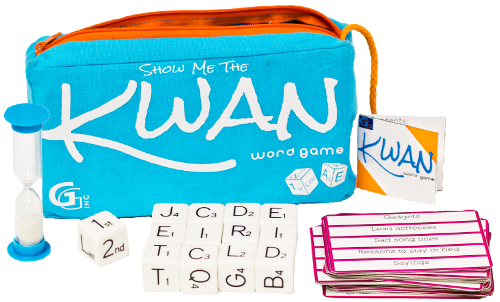 Show Me the Kwan is a fast-paced, dice rolling, word game. Given the chosen category the players must call out fitting words where either the first, second or last letter correspond to the lettered dice that were rolled. Each dice has an assigned point value. At the end of the 1 minute round, all players must count their points on the dice they collected. http://shop.griddlygames.com/ and use the codes FREESHIP for free shipping on Kwan ONLY, or code 10FORME for 10% off their entire order. Disclosure: I will receive the above mentioned product for the purpose of a review. No other compensation was received. All opinions stated are my own and may differ from yours. See my disclosure policy for more information.